Today’s purchase: This note card by Gusano de Luz. I swore to Dave that I wouldn’t shop on this trip given the fact that we’re heading into New England winter heating bills and my economic future is hazy…but of course I had to check in on my favorite spots today…the news: we are in the midst of an enthralling Mexican wrestler moment here in San Miguel. 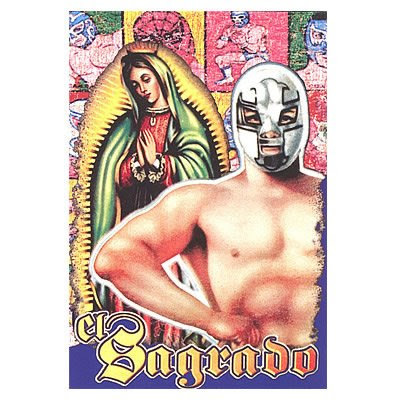 El Santo is turning up on almost as many items as the Virgin of Guadalupe and Frida Kahlo. I even saw a puta doll wearing a painted wrestler mask. I exhibited extraordinary restraint by keeping the damage to the above note card and to three wrestler-and-glitter-embellished boxes of matches (justified because of the cord of wood that’s waiting at home to be burned this winter).